← Improved survival and improved Bayley scores among infants born in the periviable period. Survival of extremely preterm babies in a national cohort, and a comparison of nations. As a follow up to my last post, a new article from Norway details the survival to one year of age, and the neonatal morbidities of babies born at 22 to 26 weeks gestation in the whole country in 2013-2014. (Stensvold HJ, et al. Neonatal Morbidity and 1-Year Survival of Extremely Preterm Infants. Pediatrics. 2017). A great thing about this article is that the numbers of fetuses/babies alive at each point are detailed in the first table, of the 420 babies delivered. 335 were alive when the mother was admitted to hospital, 145 were stillborn, leaving 275 who were liveborn, and 251 admitted to a neonatal unit. As you can see from the data below, more babies are stillborn at 22 and 23 weeks than later, after being alive on admission to obstetrics; probably a major part of that difference is an unwillingness to actively intervene, especially to perform cesarean deliveries, when the expected mortality is very high. What is quite obvious is that survival is very different depending on which denominator is used, these data are a very clear example of that; changing from 5% among all births to 60% among those admitted to NICU at 22 weeks gestation (60% being 3 of the 5 babies actively treated). Another nice feature of this article is that the modes of death are reported: of the 66 deaths there were 34 that followed a decision to redirect care. The authors don’t report these data by gestational age, but I wouldn’t be surprised if redirection of care occurred more rapidly in the most immature babies. Seventeen of the 34 redirections of care occurred because of severe intracranial hemorrhage, which, given the poor predictive value of head ultrasound, is a practice we should re-consider. The authors then compare their data to recent European publications of national cohorts of extremely preterm infants. As you can see the percentage of babies admitted to intensive care was similar in Norway and Sweden, lower in the UK at 22 and 23 weeks, and a little lower at 24 weeks, and very different in France, with almost no admissions at 22 or 23 weeks, and many fewer at 24 weeks gestation. As for survival, despite a similar proportion receiving intensive care, babies in Sweden were more likely to survive at 23 and 24 weeks, than the Norwegian babies. In the UK the survival was almost non-existent at 22 weeks and much lower at 23 weeks, and the French babies never survive before 24 weeks, and even at 24 and 25 weeks survival is lower. Finally the authors of this study compare their outcomes to a previous national cohort from 1999-2000, and suggest that, although the proportions dying before obstetric unit admission increased, and the NICU admissions increased overall, (putting together the 22, 23 and 24 week gestation babies) there was no increase in overall survival. But in the first cohort there were only 2% of babies born at 22 weeks admitted to the NICU (1 baby) and 23% of live births at 23 weeks. 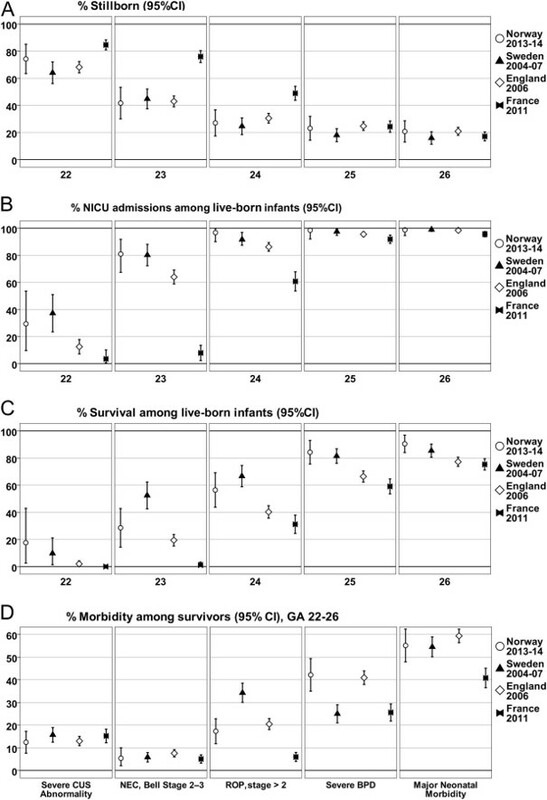 With the change in the distribution of gestational age among babies admitted to the NICU, and many more of the most immature babies being actively treated, the fact that the survival among live born infants did not change (44% to 41%) and the survival among infants admitted to NICU was also unchanged (44/83, 53% compared to 50/99, 51%) is to my mind a trend in a positive direction. This entry was posted in Neonatal Research and tagged mortality. Bookmark the permalink.